Type a question, and we will find the answer. We answer e-mails within 48 hours. 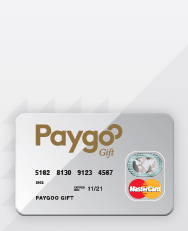 Paygoo Prepaid MasterCard® Gift is a gift card that can be used online and in any store that accepts MasterCard cards. The giftcard can be bought at Narvesen, 7-Eleven and Shell/7-Eleven, where you fill the card with an optional amount between 200 NOK and 2000 NOK. Where can i purchase cards from Paygoo? Paygoo cards kan be purchased at Narvesen, 7-Eleven and Shell/7-Eleven – find your nearest merchant here. All Paygoo cards are valid for five years from the cards manufacturing date. Expiration date is printet on the card. How do I shop online using Paygoo Gift? When you are shopping online with your Paygoo Gift-card it is very important that you type in the correct information in the name and adress fields. Information that should be typed is shown underneath. How do I shop online using Paygoo Reload? When you are shopping online with your Paygoo Reload-card it is very important that you type in the same information as used when registrering your My Page-account. How can i check the card balance and transactions? Card balance and transactions can be checked at My page, or by texting codeword BALANCE <space> your customer-ID to 2380. The service costs 5 NOK which will be charged your card balance. I have lost my card. What should i do? We dont know the identity of the card user. Therefore you must provide us with your card number or your customer-ID, so that we can block the card for further use - please contact our customer service. We can send you a replacement card if you can present proof of purchase. The replacement card costs 125 NOK which will be charged your replacement card balance. I have lost my Paygoo Reload card. What should i do? If you have lost your Paygoo Reload card, you need to block the card in "My Account". Afterwards contact us as hello@paygoo.no, remember to supply your customer ID. We will then issue a replacement card. The cost of this service is 125 NOK/SEK. I dont have my cards PIN. What should i do? PIN for Paygoo Gift can be retrieved here, Paygoo Reload here or by texting codeword PIN <space> your customer-ID to 2380. The SMS service costs 5 NOK which will be charged your card balance. I want to set up a PayPal-account, but it fails. What do I do? You create your PayPal-account as usual with your name and address, but when you add your Paygoo-card in PayPal you must use PAYGOO GIFT as name and Dronning Eufemias gate 16, 0191 Oslo as address. PayPal verify this information and if not this is correct you will not be able to set up the account. PayPal sends a test transaction to us. In this transaction there is a 4 digit code. You will need this to activate the account. It may take 1-2 days before we receive it. Send us an email and we will send the code back to you. The code is entered in your e-wallet. Can i withdraw cash from ATMs using Paygoo Gift? No. Paygoo Prepaid MasterCard® Gift can only be used online and in stores that accept MasterCard cards. Can i withdraw cash from ATMs using Paygoo Reload? Yes. 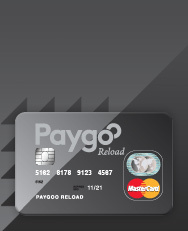 Paygoo Prepaid MasterCard® Reload can be used at any ATM, for further information see our our terms & conditions. Can minors use Paygoo cards? You have to be 13 years to buy Paygoo Prepaid MasterCard® Gift, and we recommend that parents and guardians give users under 18 years guidance in use of cards, security and use of digital money. Paygoo cards is also a good tool for those who wants to teach their children about use of digital money. The card is not working. What should i do? There could be several reasons to why your card is not working. First check that the card is valid (the expiration date is printed on the card), and that you have sufficient disposable balance to complete the transaction. If the card is damaged we can send you a replacement card, if you can present proof of purchase. The replacement card costs 125 NOK which will be charged your replacement card balance. Do i have to activate the card to make it work? 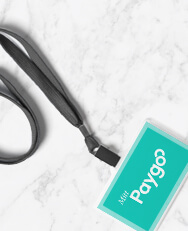 All Paygoo cards must be activated to work. You can do this here, or by texting codeword ACTIVATE <space> your customer-ID to 2380. The SMS service is free of charge.